I have purchased the parts needed. Several times. I'm going to put tape over the lever that feeds the line. I purchased 5 levers one worked. When it ran out of feed and I put another spool in, that was it. They worked for about 5 minutes, then it released ALL the line. Used 3 spools before I looked at the video on how to make it a manual feed. Glad some of you liked it but if you're on a fixed income, I wouldn't suggest you buy this one. This seems to be a problem with alot of them. I bought this last year to help with volunteer work at local parks, nature preserves, etc. I am a 70 year old male, short and 145 pounds, so wanted something light. The machine is great. Goes through vegetation like a dream. But the batteries -- and the charging system -- are HORRIBLE! I now have 5 batteries - two of 2.0Ah and 3 of 1.5Ah. They each last only a short while and it takes FOREVER to charge them - basically all afternoon and evening or overnight. If I was just doing around my house, 2-3 batteries would suffice. But for anything more, the battery system is pure junk. My old Black & Decker (18yrs) was not holding a charge & I saw this one on sale at Lowe's so I bought it & sorry I did. No power at all when edging, won't even cut through semi-thick grass, line ran out twice while I was edging so had to stop & fix. It does not hold a candle to my late one. The battery only lasted 15 minutes after a full charge. That was very disappointing. It is light weight and easy to handle. happy with price offered, trimmer and blower combo. trimmer a bit heavy for size but works well and battery life is good. Like the weight of the trimmer and that I can adjust length. But really disappointed in such short battery life. Can u replace 20V with 40 for better length of use? I needed a lightweight trimmer to spruce up my yard. I liked how light it was, I liked not having to mix gas/oil and I like that there isn’t much maintenance aside from charging the battery. I wish there was a bit more power but, for the price—it’s a deal. I love the battery feature; plenty of power for trimming around the backyard fence. I was surprised how well it edges along the sidewalk and driveway as well. The 0.065" line breaks often along the drive, but gets the job done. For the cost, worth every penny. does the battery. Charger need to stay plug in over the winter months or can you stow it with the trimmer in the box them recharge in spring? Purchased this product two years ago with additional spools, now Home Depot doesn't carry that single feed spool 20 ft. .065 in. Where can I get those now, ? How long should the battery be charged prior to its first use? BEST ANSWER: Recommended charge time is 3 hours. 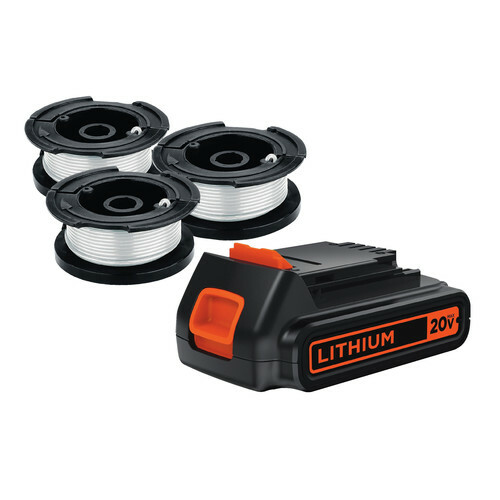 Can I use back and decker lbxr2020-OPE 20v lithium battery with model LST201?